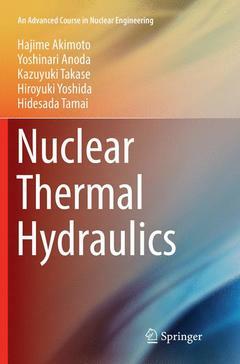 This book provides fundamentals of nuclear thermal – hydraulics for reactor design and safety assessment. It also describes the basis for assessing cooling performance of nuclear reactors under accidental conditions. The descriptions in this book are almost self-contained, beyond the assumption that readers are familiar with the introductory levels of nuclear engineering. This book helps the readers understand the processes for nuclear reactor plant design and the most important factor in nuclear thermal-hydraulics. The First Law of Thermodynamics.- Ideal gas and steam.- Second Law of Thermodynamics.- Gas Turbine Cycles and Steam Cycles.- Fundamental equations of flow.- Bernoulli's equation (mechanics of perfect fluids).- Law of momentum.- Mechanics of viscous fluids.- Laminar flow and turbulent flow (similarity rule).- Pressure propagation and critical flow (compressible fluid flow).- Gas-liquid two phase flow.- Flow oscillation.- Reactor Heat Production.- Heat Conduction.- Convective Heat Transfer.- Boiling Heat Transfer and Critical Heat Flux.- Condensation Heat Transfer.- Radiative Heat Transfer.- Thermal Hydraulics inside the Reactor.- Reactor Thermal Design.